(VEN) - In the first 10 months of 2016, Vietnam’s export value grew 7.2 percent compared with the same period last year. The industry and trade sector is striving to achieve the highest possible export value. According to the Ministry of Industry and Trade (MoIT), Vietnam exported US$15.5 billion worth of goods this October, up 0.5 percent compared with September and 8.3 percent compared with last October. The ten-month export value reached US$144.1 billion, 7.2 percent higher than the same period last year. The US continued to top the list of export markets, accounting for 22 percent of the total export value. In the first 10 months of this year, exports to this market grew 15 percent compared with the same period last year. Behind the US was the EU which accounted for 19 percent of the total export value (exports to this market increased 7.4 percent). Exports to China rose 23.9 percent and accounted for 12 percent of the total. Thanks to these results, Vietnam recorded a trade surplus of about US$3.5 billion in the first 10 months, equal to 2.4 percent of the total export value. Overall, the ten-month export growth was below the target set by the National Assembly. Compared with the same period last year, the export value of processing industry-related products grew 8.9 percent, nearly 50 percent lower compared with the growth in the same period last year; the export value of fuels and minerals decreased by 33.6 percent; and exports to the traditional ASEAN market showed a 7.6 percent decline. To boost exports in the last two months, the MoIT will continue providing businesses with more information about export markets as well as rules of origin and tariff preferences that they could benefit from free trade agreements Vietnam has signed. At the same time, market surveillance will be tightened to prevent the import of substandard materials for making export products. In addition, the MoIT will coordinate with associations and localities to provide businesses with specialized training in fields such as design, fashion, and marketing. Along with trade promotion activities, the ministry will support businesses in building brands for key products such as textiles and garments, seafood, fruit, and rice. To save time and money for businesses, the industry and trade sector will simplify administrative procedures related to import, export activities. Certificates of origin will be granted via the internet. The MoIT will seek new export markets for key products. 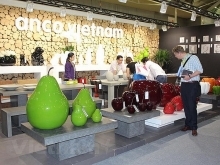 China is one of the largest export markets for Vietnamese goods. The Vietnamese minister of industry and trade has recently worked with the Chinese minister of commerce and the director of the General Administration of Quality Supervision, Inspection and Quarantine on measures to facilitate Vietnamese exports to China.